When it comes to organizing a home, the laundry room is often a space that people struggle with. Just because it’s associated with the dreaded chore, the laundry room should look and function just as good as the rest of your home. 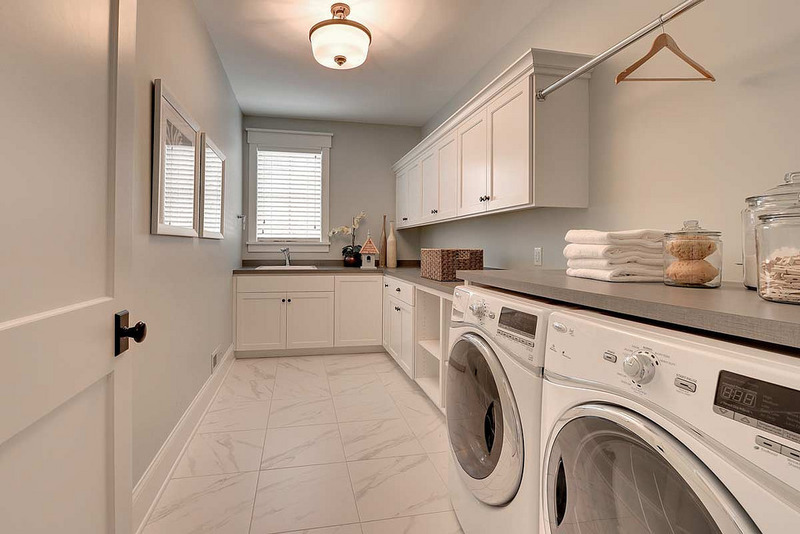 Let’s go over some tips, tricks, and organization and ascetic ideas you can incorporate into your laundry room remodel to create a more functional and inviting space. Creating a functional layout for your laundry room, especially if you’re dealing with a small space, is key to creating a space that works best for you. Consider what your family’s needs are, how much laundry you’ll be doing, and what types of laundry you’ll be doing. Functionality is unique to each family and each laundry room. Come up with a list of must haves and things you think will help the laundry process run more smoothly, then you can begin incorporating those ideas in a functional way. 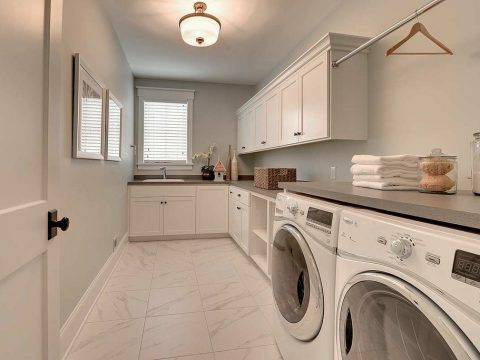 If you’ve worked hard to transform your home into a place you love, there’s no reason that has to stop at the laundry room. Look at the paint choices, cabinetry, and other design styles you’ve chosen throughout your home. Painting your laundry room the same color as your bathroom and using the same cabinetry is an effortless way to carry a similar theme throughout the home. Flooring or tile should be carried throughout the space as well. When it comes to décor, carry the same style that you have throughout the home. If your home is more modern, choose stainless accents and mountings for drying racks or shelves. If you want a more rustic look, go on the hunt for some vintage décor pieces you can hang on the walls and accent pieces to fill unused shelves. One of the quickest and easiest storage hacks for a laundry room is utilizing pedestal drawers under your washer and dryer. Pedestal drawers are drawers made the perfectly fit under your washer and dryer, and they offer a great storage option for detergent, dryer sheets, stain removers, and more. These shelves take up virtually no extra space in your laundry room but make a big difference in your storage space and can be custom made by a custom cabinet maker who does laundry room remodels in Los Angeles. If you have a laundry room that is going to be put through load after load of laundry, having a good folding station is critical to keeping your space neat and organized. If you have a larger laundry room, consider adding an island, similar to a closet island, which can act as a folding station and additional storage. Even if your space isn’t large enough to hold an island, a simple wall mounted folding rack can add functionality and ease to your laundry room. Many ideas discussed above serve a dual purpose to help with detergent storage, but if you’re still unsure of where to store your laundry materials, look at any unused space in your laundry room. Even a small wall can house floating shelves or a simple drawer system that can act as a space for your detergent, dryer sheets, and other storage needs. Storage racks can also be found to hang on the backs of doors and sides of other cabinets. If you’re tired of lugging laundry up and down the stairs, consider an upstairs laundry room. The biggest perk of this design option is the ease and mobility of doing your laundry on the same level that your bedrooms are on. Not every home has space for an upstairs laundry room, but if yours does, consider how much easier it would make the laundry process. Contact your neighborhood contractor or Los Angeles area cabinet maker for a free quote. If you’re looking to incorporate a drying rack into your laundry room, think about adding a ceiling hung drying rack. The advantages of a ceiling hung drying rack include ease of access, less space wasted, and more space available for hanging clothes. These offer an alternative to traditional drying racks and are easy to put into nearly any laundry room, no matter how big or small. No matter what your space looks like now, it’s important to turn your laundry room into a space that works for you and your family, look great, and decreases unnecessary clutter. For more information on remodeling your laundry room or to schedule a quote please contact The Closet Guy.